The 200-hour listening mark has now been surpassed and another 2 weeks have gone by since my last post, during which I hit both a low and a high point in my Mandarin studies. I hit a low point because I’ve been doing at least an hour of Mandarin listening every day for the past few months and all of the sudden I had the feeling that all of my ChinesePOD Elementary podcasts were too easy and the Intermediate ones were too hard and that overall nothing was actually ‘sticking’ in my head despite all the listening I had been doing. I realized that this was due to the fact that, although the lessons and dialogues on ChinesePOD are high quality in terms of being well-thought out and explained, not to mention the wealth of learning resources for each lesson on the website (and the high quality audio of the lessons, which is the one major bummer about CSLPod), there is no natural progression or repetition as far as the teaching of vocabulary and structures is concerned, and therefore no instructional scaffolding (or base) is provided on which to improve and eventually become autonomous (in this case that means divorcing yourself from English-language explanations). Although the autonomous learner in me loves the fact that you can just jump into the ChinesePOD library and graze the content that most strikes your fancy, with ChinesePOD there such a wealth of lessons that you can very quickly get overloaded if you don’t have some method of organizing your learning in order to get the necessary repetition required for words and phrases to ‘stick’. And that is the beauty of the ChineseLearnOnline teaching method – it’s a progressive Mandarin course, meaning that each lesson builds on the vocabulary structures (scaffolding) taught in previous lessons. This is achieved by starting out teaching entirely in English while introducing a few new words of Mandarin vocabulary in each lesson. Additionally, new expressions, especially multi-character ones, are broken down and decoded to facilitate understanding. As the lessons progress, gradually more Mandarin and less English is spoken (where the Mandarin spoken always consists of words and expressions learned in previous lessons), eventually leading to lessons conducted entirely in Mandarin (around level 3), where you’re learning Mandarin through Mandarin, with only occasional clarifications in English, if any. Coming from having extensive listening experience, I was able to jump in at the beginning of level 3 (lesson 121), where they are just starting to teach you the words they will use throughout the rest of the course to teach you Mandarin through Mandarin, but there are still a lot of explanations in English. After two weeks I am well into level 4, as I wanted to get to the primarily-Mandarin episodes as quickly as possible. As a result I am having to go back to occasionally review vocabulary that didn’t stick the first time through, but I prefer that to spending too much time with the same vocabulary/at the same level, or to put it another way, I’d rather my input be extensive (covering a wide range of contexts) rather than intensive to maximize vocabulary exposure. If you want to try out CLO, the first few premium lessons of every level are free on the webpage and on iTunes. As revolutionary as this method is, I’ve found that the simple act of reading through the stories is not enough for the characters and their meanings to really ‘stick’, which is why I started learning the characters utilizing this method in conjunction with the spaced repetition writing/stroke order practice employing the already existing vocabulary list for the entire book on Skritter, allowing me to learn characters at a much faster rate, especially because new characters studied are made up of elements already learned, which means that new learning and review take place simultaneously and naturally. 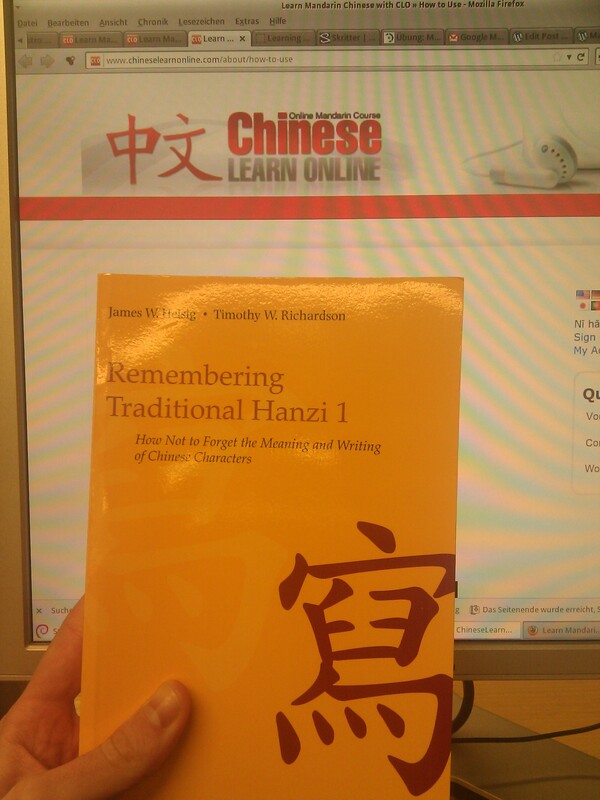 An additional plus to using Heisig’s books is that the site Reviewing the Hanzi was specifically designed to support individuals learning the Chinese characters with this method, and provides a forum where individuals can augment the stories provided in Heisig with their own mnemonic devices and study the characters using spaced repetition. 謝謝！：）Your blog looks interesting, I just shared it and am in the process of checking it out! Don’t you think CLO is a bit expensive? I just checked their pricing now and it seems a bit overpriced in my view. Thanks David but as far as I know the 20 dollars one-month membership does not allow access to the MP3 audio files… To get them you have to buy their packages per level and they are much more expensive : 50 dollars per level, very overpriced if you ask me! Hi David, I am still a bit confused since I haven’t seen the audio files mentioned in the 20$ a month membership! Besides, what would be the interest to buy their one-level packages at 40$ each then? Hi James, thanks so much for your comment, as you can see, I’m not the best in the world at pinging people back immediately 🙂 Mandarin is definitely keeping me busy, but I’ve never concentrated so single-mindedly on learning a language before, and I’m getting an itch to dabble in something else, though it will most likely be Turkish or Japanese before Korean:) I wish you all the best in your endeavours (language learning and otherwise:), and best regards from Göttingen! Great blog you have. Interesting to read about CLO and their methods in teaching Mandarin Chinese. I will have a look at their website. I found your blog as I was doing a Google search on Heisig. There are so many people that have negative things to say about Heisig so it is interesting to find yet another person who is enjoying this method of studying hanzi. I am currently busy with RTH Book 1 in Simplified Characters and am about 50 characters shy from completing the book. It’s taken a long time (about 6 months if I exclude a few months off) in between but I am nearly there. I feel I have a greater understanding now of how hanzi work – something I never had with traditional methods of study. It’s great to hear that you’ve also had success with Heisig! I don’t know why people seem to have such a big problem with his book, essentially any method that helps you to learn is a good one in my view! By the way, did you check out the website http://hanzi.koohii.com/learnmore#study-and-share-stories that I mentioned at the end of that post? It’s a great supplement to the book! Best Regards from Germany and best of luck with your Chinese studies! I quote you: “people seem to have such a big problem with his book, essentially any method that helps you to learn is a good one in my view!” – wisest words I’ve yet heard. It seems everyone has an opinion of how to best learn Chinese. Just pick it up and study is what I say. Yes I know book 2 is out – I’ll probably order soon but I think it will be a while before I do book 2 – for now I need to seriously improve my listening skills before I look at another hanzi 🙂 (Seriously though – I’ll be working through Chinese pod and enjoy my new-found understanding of hanzi and be learning the pinyin for many of the characters I’ve studied with Heisig).